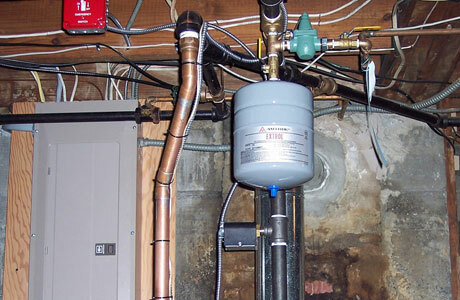 Your heating system is one piece of equipment that should never be overlooked. H.B. Steele & Son knows how important it is to not only properly care for your heating equipment but how important it is to choose the right system for you. You can trust our certified, friendly, and professional technicians to not only answers questions and fill you in on the ins-and-outs of your options but to deliver amazing, quality service at a great price. Expect us to start from scratch. 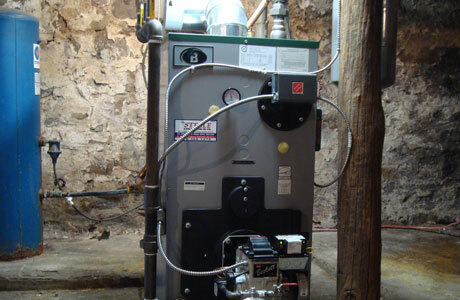 We will never look at the old boiler to judge what your house needs today, not 20 years ago. We will NOT guesstimate the size of your house: a NORA-certified service technician will perform a heat load calculation to ensure optimum efficiency. H.B. 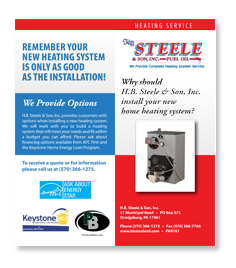 Steele wouldn’t want you to spend all the money it costs to install a new system and then skimp out on the plumbing which adds increased efficiencies to your new heating system. We remove all the old, antiquated plumbing that will do no good to your new system, leaving you with the best quality equipment and service available. 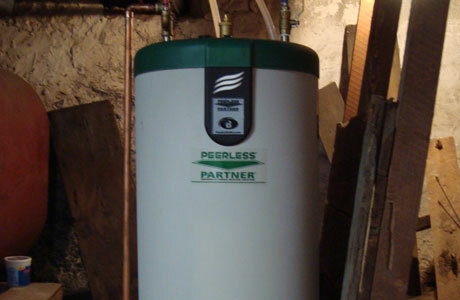 Indirect-fired water heaters lose less than half a degree of heat an hour, meeting all of your family’s hot water needs without wasting energy or efficiency. You have endless, on-demand hot water. Domestic water coils are inefficient compared to what is available in today’s market. They only produce 3-8 gallons of hot water that must be maintained all day long, running even when there is no need for hot water. Regardless of having the code inspectors or not, H.B. 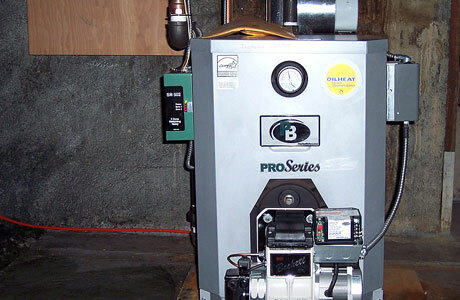 Steele follows all NFPA 31 Codes for installation of oil burning equipment. We also include new oil filtration to every job and offer aboveground tanks TankSure® Protection. H.B. Steele won’t settle for mediocre installations and we won’t settle for mediocre equipment. For that reason, here are the brands that we recommend putting in your homes and ours. Beckett Oil Burners have over 70 years of engineering and manufacturing experience culminating in leading industry standards. Their performance is of the highest quality, using features such as flame retaining heads that produce hotter heat while using ⅓ less fuel.